A friend asked me, with a budget of $600, what type of computer(s) should she buy for used by her children. She has children aged from older elementary school down. This is actually a difficult decision because that budget is right in the middle of a whole range of possible choices. For her oldest, she has already done a lot of writing in MS Word, as well as use many educational websites for math and spelling drills. For the youngest, she is still at the playing stage. What computing devices are good? First I want to rule out any Windows PC or laptop. Why? The budget certainly can buy the "deal of the month" from Staples or Microcenter or even costco -- whatever laptop or desktop they offer. Unless you are a Windows power user already, windows based computers are just too complicated to support. Apple's hardware certainly are more expensive on the surface, and never discounted by much, their products are really better -- easier to maintain. The last thing one needs at home is to constantly trying to fix software or hardware problem on the family computer. For ourselves, our main kids computer is an old iMac that I bought from Apple refurb site a few years ago. I like the physical design of the iMac because it is a simple one piece design. Nothing to go under the desk, takes up little desk top space. Both of our kids use it for browsing, Scratch programming, and drawing when they were younger. Because we are a Mac household, I can easily share their screen and see what they are doing. It is cute that, for now, when they are doing something cool, they actually want me to share their screen to see what they are doing. I am sure that will change in a few years. Best place to buy an iMac is either at the Apple refurb store. Especially older models are (relatively) deeply discounted. However the cheapest reburb iMac are usually still around $1000 or more, beyond the $600 budget. iPad is an interesting alternative. Ignoring word processing for the moment, the iPad is the perfect children computing device. It has a lot of great educational apps as well as games. It is rugged (when placed inside a good case) enough for everyday use. It is portable for trips. Using a good stylus (I recommend the cosmonaut) it has great drawing apps, that can easily shared onto Facebook or email to grandma. Even for writing, first children today are actually used to or can quickly learn to use the virtual keyboard. 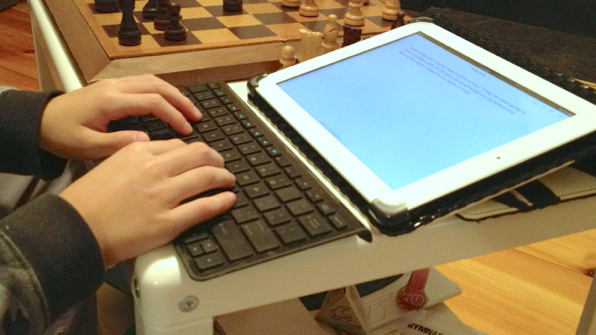 Otherwise a Amazon generic branded bluetooth keyboard will turn the iPad into a good writing machine. It is actually good to not have too many formatting options, so that the writer can focus on writing. Another benefits of the iPad is that if you set it up to do iCloud backup, the documents are always automatically backed up. One small negative with the iPad though is that it is really designed as a single user device. There are no user login, and everyone can see everything on the iPad. So if it is used by multiple children to create media, they have to learn to share and make sure they do not mind accessing each other's documents. The Mac mini is an often overlooked choice. The cheapest new Mac mini is $599. It is basically an iMac without any peripherals. If you happen to have an unused USB keyboard, mouse, and monitor available, the Mac mini is a great choice. You can also buy a non Apple USB keyboard cheaper than the nice Apple one. You should try to find a monitor that has HDMI or DVI input and has 1920x1080 resolution to do the Mac justice. Therefore, depending on how much you want to spend on monitor, keyboard and mouse, a fully functioning Mac can be built around the mini for anything from $600 to about $1000. I know this may sound a bit unconventional, but especially for younger kids I recommend getting an iPad instead of any laptops. Why? and it is definitely a Fun device! Just make sure the entire family learn to share, and make sure no private/personal document and contents are on it.